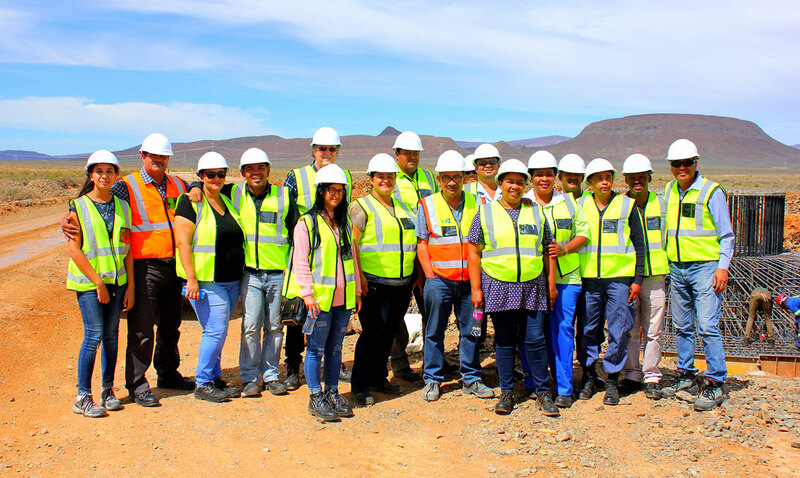 Community leaders and key stakeholders from the Witzenberg Local Municipality, visited Perdekraal East Wind Farm, the Western Cape’s largest BW4 wind farm, which is currently under construction and providing local employment to community members of Ceres, Nduli, Bella Vista and Prince Alfred Hamlet. Councillor Trevor Abrahams was amongst the first group of visitors to visit the site and commented on the potential impact of the wind farm on the local community, “We feel privileged to have an alternative energy service provider within our municipal boundaries and Perdekraal East Wind Farm is an investment that we cherish. From a Social Economic Development perspective Witzenberg will reap many positive outcomes as a result of the successes of Perdekraal East Wind Farm once it is operational,” he said. The group of visitors had the opportunity to view work already completed to-date. The wind farm’s first twenty-four turbine foundations are already finished, a phase in the construction process that is most reliant on local labour. These impressive structures measure 19 metres in diameter and provide a good indication as to the scale of work that is being undertaken. The next phase in the project’s construction milestone will be the transportation of wind turbine components. The wind turbine tower sections are being manufactured locally, on Cape Town’s West Coast, in Atlantis. The tower sections will depart from Atlantis, West Coast of Cape Town and the blades, nacelles and other components will depart from the Port of Saldanha. Perdekraal East Wind Farm has been able to achieve a very high local content percentage as the turbine towers are locally manufactured. concluded Glenn Hobson, Construction Project Manager for Perdekraal Wind Farm. The 110MW Perdekraal East Wind Farm is owned by a number of equity members, these include: Lekela, a renewable power generation company which delivers utility-scale projects that supply much-needed clean energy to communities across Africa; H1 Holdings, a wholly black owned and operational South African energy company, with a focus on developing and investing in projects in the power sector; African Rainbow Energy and Power, which aims to be a leading South African and African energy company focused on clean energy solutions; Old Mutual Life Assurance Company (South Africa), one of Africa’s largest independent investment managers; and Perdekraal East Renewable Energy Community Trust, a local community trust with shareholding funded by other project equity partners.